Smart sensors, or intelligent sensors, or smart dust, or, simply, motes, form sensor networks, most commonly using wireless technologies, into Wireless Sensor Networks (WSN). WSNs represent a significant improvement over traditional sensor networks since they can collect measurements from inaccessible areas of interest, such as a battle field or an area in the middle of a jungle, successfully and with very low power demands. Applications that deploy WSNs can vary from water quality monitoring, to health and medical diagnosis, multimedia streaming, industrial monitoring, military applications and more. Driven by the necessity for young engineers to master aspects of advanced technology, MeSA Lab research group has developed an innovative scheme for teaching advanced telemetry and telecontrol in the laboratory. The scheme gives students the choice to create and test their own scenarios to an entirely parameterized telemetry and telecontrol system that has been installed in a special controlled environment. 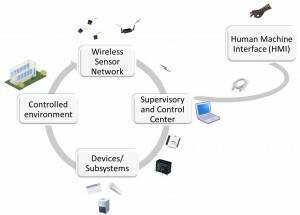 The core of the telemetry system is a wireless sensor network (WSN), which monitors the environmental conditions of the controlled environment while the control system is complemented by an override subsystem that uses an advanced user interface. Specific laboratory exercises have been designed to be used in this system. The scheme is being evaluated by undergraduate students in Electrical and Computer Engineering and preliminary evaluation results have shown significant acceptance of the system and the concept itself, as it enhanced the learning process with a more engaging approach.